The QCM200 Quartz Crystal Microbalance measures mass and viscosity in processes occurring at or near surfaces, or within thin films. This system includes a controller, crystal oscillator electronics, crystal holder, three quartz crystals, and Windows software. The instrument reads the resonant frequency and resistance of a 5 MHz, AT-cut quartz crystal. The resonant frequency changes as a linear function of the mass of material deposited on the crystal surface. The resistance at resonance changes with the viscosity / elasticity of the material (film or liquid) in contact with the crystal surface. As a gravimetric instrument, the QCM200 can measure mass ranging from micrograms to fractions of a nanogram. Detection limits correspond to submonolayers of atoms. Observations of conformational changes, such as phase transitions, swelling, and cross-linking, can easily be made. Specifically designed to handle heavy loads (up to 5 kΩ), the instruments will lossy films and highly viscous liquids. The QCM200 is a stand-alone instrument with a built-in frequency counter and resistance meter. Series resonance frequency and resistance are measured and displayed, and there is an analog output proportional to frequency which can be used to interface with a potentiostat. The QCM200 can be operated from the front panel or a PC using the RS-232 interface. Windows software is provided for real-time data acquisition, display, analysis and storage. Both frequency and resistance trends can be viewed. User-tags are provided to time-stamp important events. The stability and accuracy of the QCM200 are ideal for most experiments. 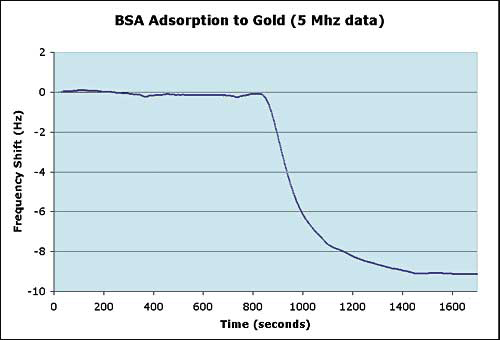 For special applications requiring optimum long-term frequency stability, a precision timebase, such as the FS725 Rubidium Frequency Standard, can be connected to the external 10 MHz input. A unique automatic gain control circuit provides the quartz crystal with the required signal amplitude to overcome viscoelastic losses and achieve series resonance. 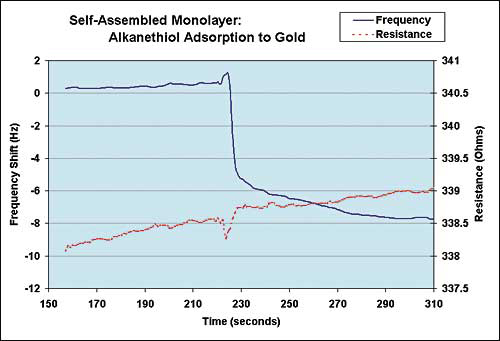 It also monitors the energy dissipated by the sensor, which is used to determine the series resistance of the crystal. The controller provides power to the crystal oscillator electronics, and includes a potentiometer for canceling shunt capacitance. Proper capacitance cancellation is required to assure true series resonance operation of the crystal oscillator, and to eliminate frequency and resistance errors. The QCM200 uses a 5 MHz, 1" diameter, AT-cut quartz crystal wafer with circular electrodes on both sides. Crystals are available in a variety of materials. The crystal holder is a rugged, compact, easy to use fixture. The holder and all crystals may be used in liquid or gas environments. 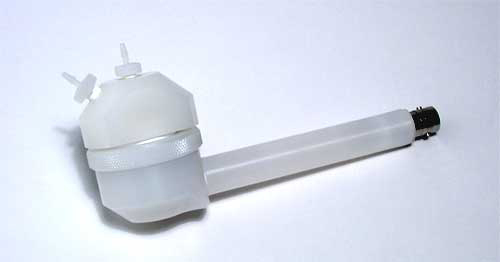 An optional axial flow cell adapter attaches to the standard crystal holder. 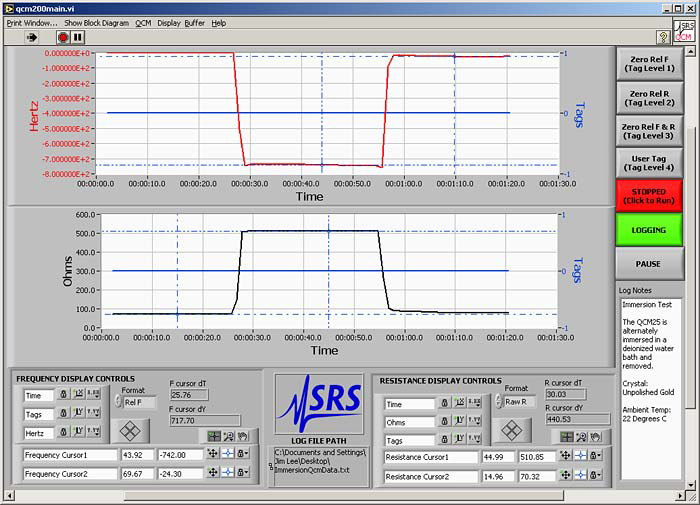 This provides an easy way of interfacing the QCM to a flow injection analysis system. For EQCM applications, an analog output proportional to frequency shift may be directly connected to a potentiostat or galvanostat. Only the front-surface electrode of the crystal is exposed to the solution. This electrode is also transformer isolated, as required for EQCM operation. 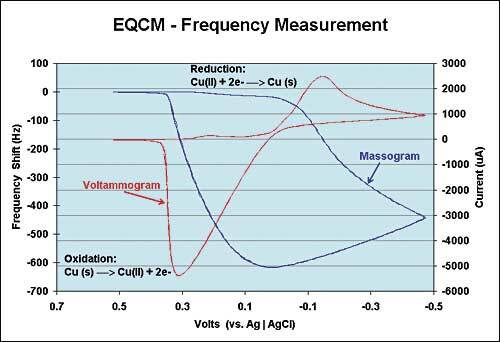 The figure below illustrates a typical EQCM experiment. The frequency analog output of the QCM controller is connected to the potentiostat A/D input. The potentiostat digitizes the voltage, and it's software displays relative frequency changes synchronous with the electrochemical data. The versatile QCM200 can be easily integrated into any custom 5 MHz crystal based EQCM setup. The QCM200 is a valuable research tools for applications ranging from pure surface science to biochemistry. Quartz crystals can be pre-coated with any thin film material including organic polymers, hydrogels, composites, ceramics, biomolecules, bacteria and living cells. This provides unlimited potential for the development of novel gas and biological sensors. The quartz crystal microbalance is an essential addition to any biological laboratory. 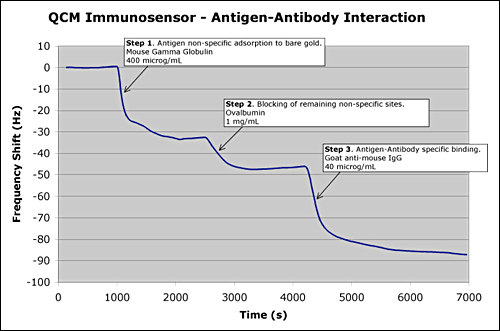 The data from a QCM perfectly complements that obtained from other techniques, such as surface plasmon resonance (SPR) and atomic force microscopy (AFM), aiding in the analysis of complex biological interactions. A Windows software program is included to facilitate remote operation and simplify data acquisition. Dimensions, weight 10.6" × 2" × 7" (WHL), 2 lbs.